Zooey Deschanel. Photo by Briana Baldwin. Zooey Deschanel Quotes. 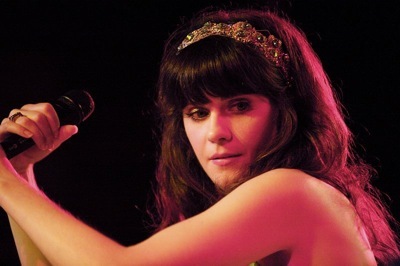 Deschanel (1980 - ) is an American actress and musician. She has starred in (500) Days of Summer , Almost Famous , Winter Passing and All the Real Girls . 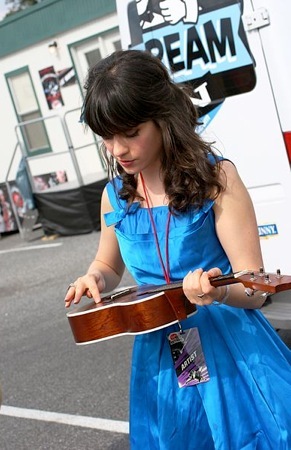 Together with M.Ward, she has released several albums as She & Him . Currently she stars in New Girl , a comedy on Fox. Joseph Gordon-Levitt and Zooey Deschanel. Photo by CAryn Loveless. Most of the movies I've done, I can find something I relate to, but I'm not playing myself. I just have to be able to see their point of view. When you're acting you're totally at the mercy of someone else. They can cut you together to make your timing totally different. They can cut two takes and manipulate you, which is an incredible thing in many ways because they can make you look better, or they can make you look worse. In the end, I do not have control over what's on screen which is very terrifying. I really do feel that for a long time women didn't have the place in comedy that they should. I mean, I've had some amazing roles, but when you get sent scripts and you see you're always playing someone's girlfriend when you want to be the central role, it's so depressing. As a comedienne, it felt so frustrating to always be setting up someone else's comedic moments. There's always a little sort of Summer camp sadness to doing a movie. You know, you're having a really good time, it ends, and then there's a certain amount of, I think, melancholy to that. And I like that doing a TV show you have the potential for this to go on, and that potential is a really nice thing. You have to keep reminding yourself it’s not about money, because there is a lot of money to be made in this business if you’re willing to do whatever. But that’s not what I’m thinking about. I continue only to take movies because I love the script and because I really want to do it. 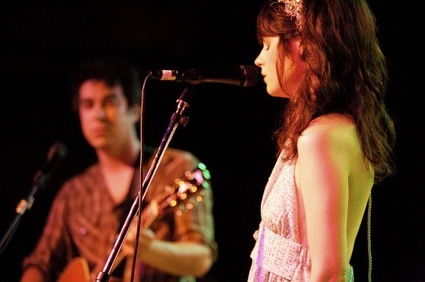 Zooey Deschanel and M. Ward. Photo by Briana Baldwin. I think for any kind of art-making you have to do it for the process and not the reaction, not in anticipation of anybody's response. [When you're in control,] you can bring something into the world and say: "That's what I put out and that's a real reflection of myself and it's truthful and honest and sincere." With a movie, it can be a really amazing collaboration but a lot of the time it can be a director saying "Do it this way, do it that way" and it's not a reflection of who you are, it's a reflection of how well you're able to take in someone else's advice. It’s an addiction. I love clothes. I like to go down Melrose and look in all the windows and I go to different flea markets. I have lots of costumes. You never know when you're going to have to dress up like a milkmaid from the 1600s. I'm always looking for a way to be creative. Fashion, hair, makeup, and nails — all these things are ways you can express yourself. I’ve gotten more comfortable with my looks as the years have gone on. All the things I like about myself go along with my flaws. I just have to accept those things. If you feel like dressing like a girl, there’s nothing wrong with that. I think my own personal style always ends up seeping into characters that I play. I’ve always had a very distinct idea of fashion for myself, and what a character should wear. But, our costume designer [on New Girl] is all kinds of amazing. I’m obsessed with her. I love her so much. She’s my fashion soulmate. We just nerd out on fashion. Wear what looks good on you. Also, fabrics have gotten a lot more comfortable in recent years, so new clothes with vintage cuts are also a great option for practicality. I always find it fun to plan what I’m going to wear on stage [for She & Him performances]. It’s totally different stuff from what I would wear in real life. I like matching my outfits to the backup singers. My 1960’s Courreges military coat. ––on what's the most treasured item in her closet. Your hair is part of your identity, and I've always felt like a brunette with bangs. I've grown my bangs out before, but I feel more comfortable with it. I sweep it sometimes for a little change of pace. It has its own personality! I love old music, old movies, screwball comedies, vintage clothes and basically I’m an old-fashioned gal. Sometimes I feel that [I was born in the wrong era]. But then I'm happy that I was born when I was because I think in a lot of ways all of the modern conveniences make it easy for you to cherry-pick the best things out of other decades. Return from "Zooey Deschanel Quotes" to our main quotes page.